Parting = Sweet Sorrow. Indeed. Warning: LONG post ahead. Read at your own peril. Or bookmark it and come back until you finish! But it means I’m back in business and I have a lot of ambition to write down the vast myriad of thoughts that have been roaring through my head during this run of “Nozze” here in Chicago. I’ll do my best to make good on my goal! But, first things first, as tonight is the 11th show in a beautiful run of perhaps the greatest opera ever written. (Go ahead, let the debate commence!) I’ll tell you, it must be a masterpiece, because to do 11 shows back to back and find new things in it each and every single night, and to feel such excitement to return to those very same notes and words time and time again – well, it’s simply sublime. I think if you take any trained musician (be it pianist, violinist, singer – yes, we’re musicians, too!) they will all marvel at the dichotomy that is Mozart. His music bares a complexity that boggles the brain, and yet it requires the utmost simplicity to execute. It somehow carries a mastery of mathematics and symmetry, and yet it wafts off the page into something airy and indescribable, achingly human in its entirety. I think part of the equation involves simply getting out of our own way, and letting that perfect balance of complexity and simplicity work it’s magic. But that’s a tall order, because it takes a mountain of technical mastery to even make it through the phrases: too much emoting, and it somehow becomes self-indulgent; not enough purity of line from both the voice and the orchestra, and we become too aware of the difficulty at hand. For example, each time I start “Voi che sapete”, I’m achingly aware of how Mozart somehow could write such a simple, almost “bad” song and make it transcend (on a good night, that is!) so completely. He somehow becomes a 14-year old adolescent boy with a gangly body and a true poet’s heart, and turns a very elementary vocal “study” with simple chord progressions and the most rudimentary accompaniment into a true miracle of vulnerability, wonder, discovery, sincerity and love, penetrating so completely the heart. I love envisioning Cherubino writing his song. It was by candlelight, obviously, and I imagine him painstakingly searching for the words, the melody, sweating and getting worked up as he tried to find the perfect words to describe his emotions. Surely he went through at least 10 different versions before settling on this one. And yet for Mozart? Maybe an hour in total? And yet he captures the soul of this boy (and us?) so perfectly. It dumbfounds me – this simplicity and yet this divinity all rolled into one. And this is only 3 minutes out of the nearly 4-hour opera. Truly, there is not a single wasted note. The other thing I’ve discovered this time around lies in the terrifying first aria. Come on mezzos – you know what I’m talking about! You arrive on the stage, nervous and excited and the adrenalin is pumping crazy through your body, and you do this nervous, fast recitative and before you have a chance to think to breathe, you’re half-way through this first aria, “Non so piu”, and you realize the high G’s are coming!! AAAACK!! I have to consciously remind myself to relax during that first recit so that I can ATTEMPT to start the aria calmly and on the breath. But that’s all technical jargon. What blossomed for me this time around was the POETRY of the text. I used to approach it as only an angst ridden, hormonal adolescent who attempts to sort through his unrelenting urges. Instead, this time I find myself enjoying the poetic side more – the presence of nature and the winds and the flowers and how he begs them to carry his feelings with them. How beautiful is that? Again, it’s sublime and shows why the Countess might actually see something profound in him. 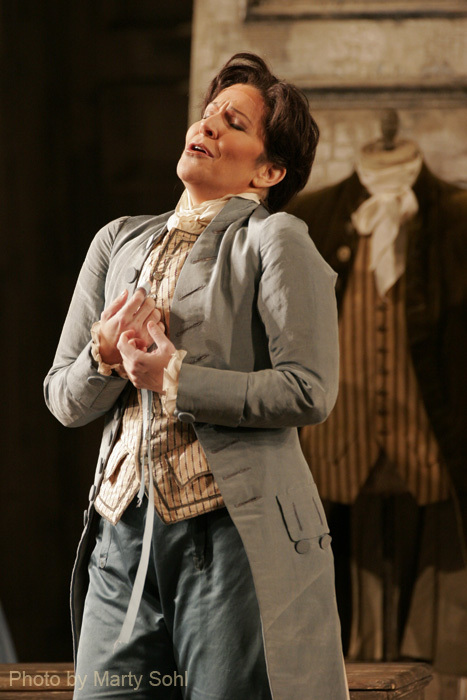 It can’t be ALL hormones – there is most definitely a true poet’s heart that lies within Cherubino. In fact, it reminds me quite a lot of Mozart himself. I dare say that when I sing Cherubino I truly feel as if Mozart himself is speaking through the music and the words – truly a little Mozart-Cherub hanging around the opera house, making sure that a playfulness remains in his masterpiece – that we can still laugh at ourselves and at humanity in general. Oh, how I will miss this piece!!!!! Wait, let me clarify. Is this my last ever Cherubino? Who knows – one never, ever knows what life has in store. For the record, I don’t have any more in my schedule for the moment, and when I have a choice of choosing repertoire, there are now different roles that I want to revisit and to tackle for the first time, but if the right project were to come along, how could I say no? (Up to a certain age, however – let’s be realistic, Joyce!) So it could very well be my last night to wear his boots, to seduce all those girls, to jump out the window, to flop in the chair – and oh, (sigh), to sing that perfect, sublime, astonishing, final chorus. Si, “corriam tutti”! Here’s the great serendipity of this however. Well, first let me say that, as I’ve said before, I find the theater to be an unbelievable teacher. I’ve often said that the only way you can successfully function on the stage is to be IN THE MOMENT: not ahead of yourself, not reflecting on what you’ve just sung – concretely, unquestionably in the moment. It’s the only possible recipe for success, because it’s only there that you can be 100% present, and therefore give, relentlessly, everything you have. This is also supremely true of life – or at least how I strive to live. So yes, I’m sad that this may be my last time, but in the moment, I will be alive and reveling in every word, phrase and emotion. But it’s also a handing over of a baton, in a way. My husband has stepped in for some of the performances here in Chicago, and they have been his first conducting “Nozze”. My last – his first. I find that incredibly beautiful. So while Nozze may be ending for me, it is only beginning for him, and that makes me a very happy wife. It’s been a sheer blast watching him discover this piece from the INSIDE, not as an observer, and the passion for this that has ignited in him has been beautiful to watch. He had to step in and do his first performance here without any rehearsal with the orchestra at all – talk about walking into the fire! The first time they saw him was his downbeat on the overture! It was such a privilege to share that night with him, as it will be tonight, and I wish him MANY more chances to live deeply inside this music. So, that’s about it. I think the emotion will be running in full force this evening, which means I have to get my head about me: warm up carefully, think only about the task at hand, be sure to follow that handsome conductor, and simply let it be what it will be. Afterwards, I’ll probably dissolve completely, but that’s all part of the glorious ride, isn’t it?